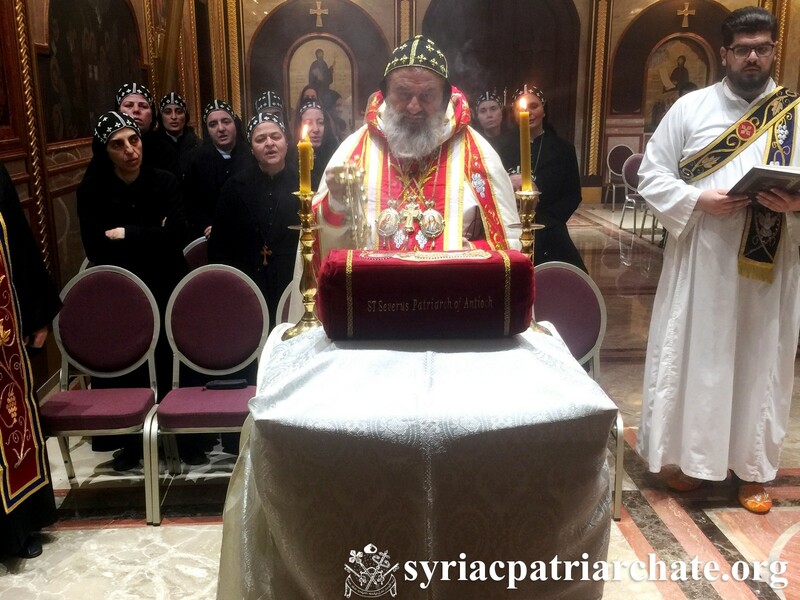 On February 21, 2019, for the occasion of the commemoration of St. Severus the Great, His Holiness Patriarch Mor Ignatius Aphrem II celebrated the Holy Qurobo at St. Severus Church in the Patriarchal Residence, Atchaneh – Lebanon. His Eminence Mor Chrysostomos Mikhael Chamoun, Patriarchal Vicar and Director of the Patriarchal Benevolent Institutions in Atchaneh, as well as the monks, nuns, deacons, and a crowd of faithful attended the Holy Qurobo. In his sermon, His Holiness spoke about the life of St. Severus, and how he endured all persecutions for the sake of Christ and His Holy Church. His Holiness added that we should take from St. Severus an example for our lives, that we may endure for our faith and witness to our Master and Lord Jesus Christ. During the Qurobo, His Holiness presided over the Service of the Saints, and made a procession for the relics of the Saint which are kept at his Church in Atchaneh. At the end of the Qurobo, His Holiness and all who were present took blessings from the relics. St. Severus Church in Atchaneh was consecrated last June for the 1500 Jubilee of the Exile of Patriarch Mor Severus the Great to Egypt. Their Holinesses Pope Tawadros II of Alexandria and Patriarch of the See of St. Mark, and Catholicos Aram I of the Great House of Cilicia of the Armenian Apostolic Church, participated with His Holiness Patriarch Mor Ignatius Aphrem II in the consecration of the Church. Pope Tawadros II brought with him part of the relics of St. Severus kept in Egypt, as a symbol of the Saint’s return to Antioch after 15 centuries.